Where are the must-see Mayan Ruins in Campeche, Mexico? Campeche is one of the 31 beautiful states of which Mexico is comprised. Campeche's capital is Campeche and was founded in 1540 as the Spanish conquistadors began their conquest of the Yucatan Peninsula. 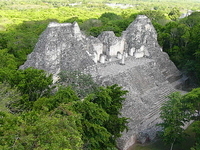 The state is home to several Mayan ruins; however, they are not nearly as well known and visited as others in the state of Yucatan to the north and north-west. Because of this, I will help you figure out where to go and which ruins are, in my opinion, the best in the state. Edzna is an amazing site with artifacts dating all the way back to 400 BC. The site was originally discovered in 1907, however no excavation or exploration was conducted until 1958 (51 years later). One of the most impressive structures at the site is the Edificio de Cinco Pisos (in English, this means Building of 5 floors or 5 story building). It is a beautiful 102 foot tall building which rises 5 levels from the ground. It houses many rooms and glyphs (images carved into the stones with different meanings). The Principal plaza is another impressive feature of this ancient site. The plaza is approximately 525 feet long and about 328 feet wide and is surrounded by temples. This plaza is well known for a structure known as Nohochna (the big house or the mansion) It is believed that this structure was used as a political stage and was where administrative action took place. This is a great site to visit if you need a quick half day excursion. Xpuhil translates to English as Cat's Tail, thusly named after the type of vegetation in the area. It was discovered in the 1930s and since then, 17 groups of structures have been completely uncovered. This site was the head municipality of Calakmul (we will talk about this site next) which is one of the most important Mayan cities in the region. This site is most famous for one structure known as the building of three towers since it was built in a style completely different that all the other buildings which were excavated at the site and it also houses a basement. It is a beautiful site which would make an excellent half day trip for you and your family. The ancient city of Calakmul was one of the most important Mayan cities of its time and is located deep in the jungles of the Peten Basin region of Mexico. It was known as the Kingdom of the Snake or Snake kingdom and was one of the most powerful cities with an estimated population of over 50,000 people. The site was discovered in 1931, and after years of excavation and research, it has been determined that there are over 6,500 different structures at the site. The site itself takes up approximately 7.7 square miles and is mostly covered with dense residential areas. Although Calakmul is a modern name which means city of the two adjacent pyramids, there is much confusion about the city's real name. This site is definitely best if you want a full day's adventure with your friends, family or even just alone. Becan was thriving metropolis in the ancient world and remained lost to us until 1934 when it was rediscovered. It was named by archaeologists and it means canyon formed by water. They gave it this name because the site has a very unusual feature, a ditch that surrounds it. The archaeologists who worked on the site discovered that it was inhabited as early as 550 BC and flourished over the next half a century. Around 500 AD, it is thought that the population grew dramatically and increased the city in size, and population, as well as increased the amount of trade and agriculture of the city. The city is believed to have fallen and been abandoned by its people by about 1200 AD which means the site had a life span of 1,750 years.